Patriot this week started sales of its top-of-the-range VPN100-series SSDs. Prototypes of these drives based on the Phison PS5012-E12 controller were demonstrated at CES 2018, but it took the company and its partner quite some time to finalize them. The undertaken efforts paid quite well: the Viper VPN100 promises to be one of the fastest SSDs on the market. To ensure that the drive performs consistently, Patriot equipped it with a large heatsink and an external thermal sensor. Based on the Phison PS5012-E12 controller, the Patriot Viper VPN100 drives carry 256 GB, 512 GB, 1 TB, or 2 TB of usable 3D TLC NAND flash onboard along with DRAM cache. Being aimed at high-end PCs, the drives feature an M.2-2280 form-factor along with a PCIe 3.1 x4 interface. 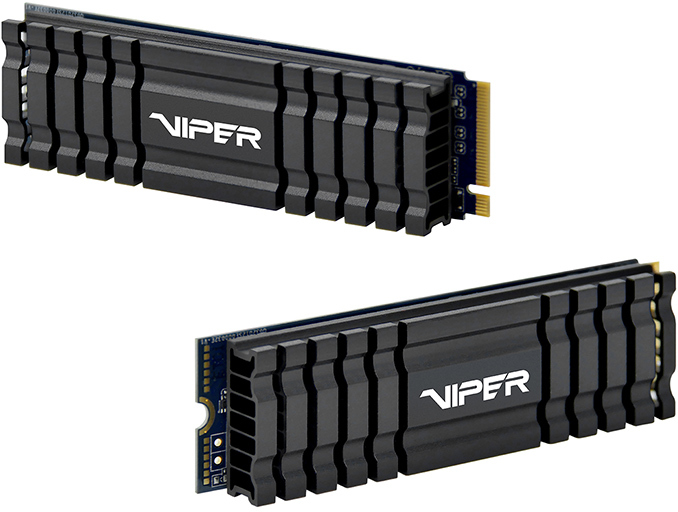 Given capabilities of the controller, the Viper VPN100 SSDs are NVMe 1.3 compatible, feature a robust LDPC-based ECC engine, SLC caching, and other features that customers come to expect from modern drives. From performance point of view, the Viper VPN100-series products look quite impressive. The fastest 1 TB model offers sequential read speeds up to 3450 MB/s as well as sequential write speeds of up to 3000 MB/s. As for random read/write performance, we are dealing with an SSD capable of up to 600K read/write IOPS. Retail Price at Launch $59.99 $94.99 $199.99 ? To ensure consistent performance even under high loads that might get the SSD controller very hot, Patriot equipped its Viper VPN100 drives with a large aluminum heatsink featuring six rather thick fins. The radiator will naturally prevent these SSDs from being installed into high-performance laptops, but this is a tradeoff that the manufacturer decided to take. Furthermore, the SSDs feature an external power sensor (in addition to the one integrated into the controller) to better monitor temperatures of the device. It was unclear if the heatsink would block a GPU if placed in the M.2 slot above a PCIe slot. All Patriot Viper VPN100-series drives are backed by a three-year warranty. 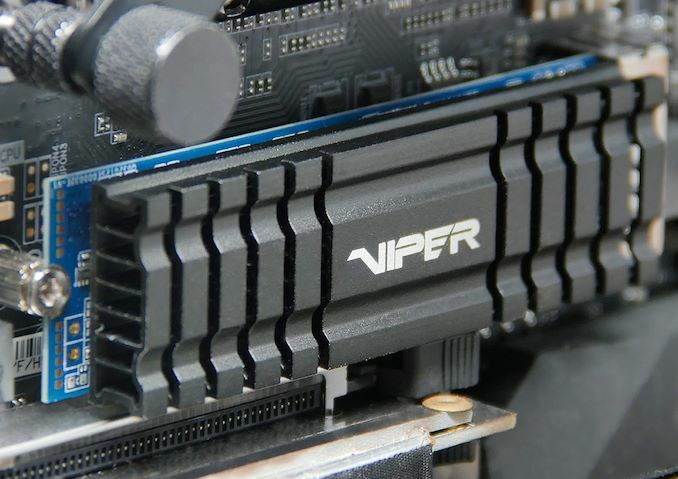 The Viper VPN100 256 GB carries an MSRP of $79.99, the 512 GB version features a recommended price of $137.99, the 1 TB model costs $244.99, whereas the top-of-the-range 2 TB SKU is priced at $499.99. Meanwhile, retailers like Amazon and Newegg already offer the new SSDs with tangible discounts. For what it's worth, my Quarch power meter internally samples at 4µs intervals but is usually configured to average in batches of 32k samples to reduce the volume of data. But even with ~1/8th second averaging, that's still quite a bit quicker than the seconds or minutes it takes NVMe SSDs to reach thermal throttling temperatures when subjected to unrealistic torture tests. Any power spikes in excess of the <6W sustained that I've measured were far too short-lived to have relevance to cooling needs.